The opal is the suggested gem for the 13th wedding anniversary. 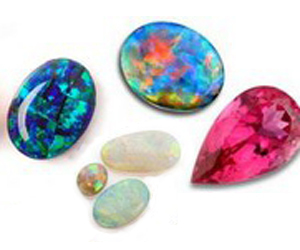 Most opals are 50-65 million years old, dating back to the Cretaceous period when dinosaurs roamed the earth. According to folklore opals are said to bring its wearer the power of premonition and to pale in the presence of poison. Black opals come from the Lightning Ridge region of Northern New South Wales in Australia and are considered the most rare and valuable type of opal.